For all of the successes Walt Disney had in motion pictures, he had yet to produce a true sequel. He was famous for saying "You can't top pigs with pigs" when sequels to his famous short, The Three Little Pigs, weren't as well received as the original. However, for his TV audience he would often continue stories that became popular. Davy Crockett, for example, was killed off after three episodes, but viewers were delighted to find two more episode the next season (both seasons were edited and released theatrically as Davy Crockett: King of the Wild Frontier and Davy Crockett and the River Pirates). But after having big success with The Absent-Minded Professor in 1961, it would have been bad business not to have attempted a sequel. Robert Stevenson returned as director, Fred MacMurray, Nancy Olson, Keenan Wynn, Tommy Kirk and nearly every other actor from the first film returned for the sequel. Ed Wynn makes a cameo appearance as a different character than he played in the first film. And Bob Sweeney (Toby Tyler and Moon Pilot) joins the cast in his last Disney role. Ron Miller, a college football player himself, coproduced this film with Bill Walsh. The film was mostly shot on the Walt Disney Studio lot. Much of the football sequence was actually shot indoors due to the challenges of pulling off the special effects in an outdoor environment. Like the original, this film was shot in black & white to hide many of the secrets behind the special effects. The film begins with fighter jets being passed by a flying Model T. As the credits play, Professor Brainard and student Biff Hawk fly to the pentagon to ask for money he has yet to receive for his invention of flubber. They return home empty handed as Medfield College is preparing to fund a new science building, dubbed Flubber Hall. However, when Professor Brainard can't pay back the school's loan to Alonzo Hawk, he threatens to level the college. Upon arriving home, a company offers him a million dollars for exclusive rights to flubber, but because of his outstanding deal with the US government, he is unable to accept. Meanwhile, the IRS is after him because his projected earnings were high and they feel he owes them more money than he paid, even though he has yet to receive a penny for his invention. Brainard and Betsy get in a fight, but the professor is soon distracted with helping the school's football team by providing them with flubber gas. He also uses flubber gas to create "dry rain," designed to pull moisture from the air during a drought, but the fighting between him and Betsy intensifies when she meets his old girlfriend, Desiree, and she moves out on him. Brainard's dry rain invention has a side effect where it shatters nearby glass, unbeknown to him. He turns down another scheming offer from Alonzo Hawk, who wants to turn flubber gas into a weapon, and helps Medfield win the football game by inflating a player and throwing him with the ball instead of the ball itself. He is then put on trial for flubber gas, which is perceived to be dangerous due to its glass shattering side effects. However, when a witness proves that it also caused crops in the area to grow large he is let off the hook. 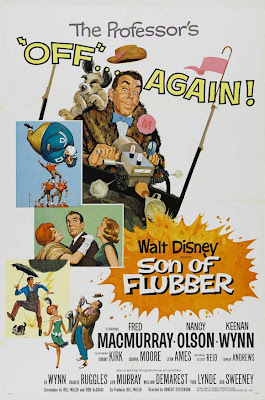 Son of Flubber was released on January 18th, 1963. Critics unanimously agreed that it wasn't as good as The Absent-Minded Professor, but was equally as funny. Audiences flocked to see it, making it a huge hit. It made over $9 million in its theatrical release. 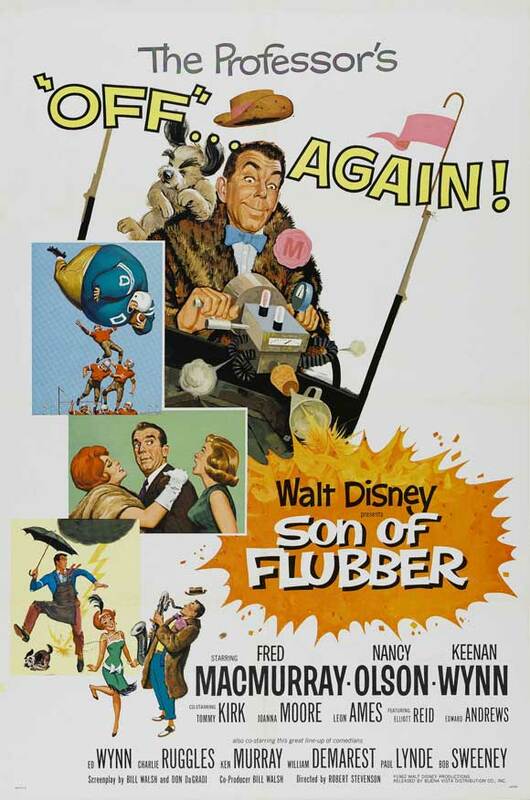 Son of Flubber was rereleased to theaters in 1970. It didn't make its TV debut until 1980 and was released on home video in 1984. A colorized version was released on VHS in 1997. This sequel is cut from the same cloth as most in that it basically tries to recreate what was successful about the first one. That's not necessarily a bad thing and Son of Flubber is certainly a decent and funny sequel to The Absent-Minded Professor. However the one fault that it does have is a big one, which is that too much is going on at the same time. The reason the first one worked so well was that the story was rather simple. Son of Flubber feels like it tries to be two films at once. Walter Elias Disney Miller, Walt Disney's grandson, makes a cameo appearance as a baby in a pitch reel when the company wants exclusive rights to flubber. The satellites at the end of the film were reused from a Ward Kimball segment of The Wonderful World of Color called Eyes in Outer Space that was made in 1962. A toy of Flubber was produced as a tie-in with this movie by Hasbro. Unfortunately, it had to be recalled when it was discovered that it contained an unidentified substance that gave some children a rash. Other merchandise from the film included footballs with the logo and an inflatable football player toy. Son of Flubber is currently available on DVD. It is presented in its original black & white, however the aspect ratio is pan & scan fullscreen instead of its theatrical widescreen ration of 1.75:1. This is surprising following the outcry Disney received after releasing the first film in fullscreen and color. Disney had to rerelease it in black & white and widescreen, so its curious why they would crop the sequel. At any rate, the disc contains a single bonus feature in the form of a photo gallery that presents behind the scenes photos, marketing material and merchandise form the original release. Consumers have the option of a standalone DVD, as well as a 2-pack where it is paired with The Absent-Minded Professor. The film is available in widescreen on iTunes, where it is also available in HD.